I've been wearing a lot of glitter lately. There's just something about glitter that makes me feel.... sparkly? And I've found my favorite of all time, hands-down holy grail status glitter liner: Too Faced Starry Eyed Glitter Liner. I have tried them all, and the Too Faced liner beats them all. The glitter is dense, it doesn't crack like MAC glitter liner, you don't have to spend an hour layering it like you do with Urban Decay's glitter liner and the glitter colors in the Too Faced line are just really freakin' cool. Some even have a little HOLO glitter thrown in. HOLO, people, HOLO!!! Anyway, here's a couple looks I did using the Too Faced Starry Eyed liner. I can't remember everything I used, but I know that I used MAC Magenta Madness, Urban Decay Peace and Too Faced liner in Ooh & Aah. 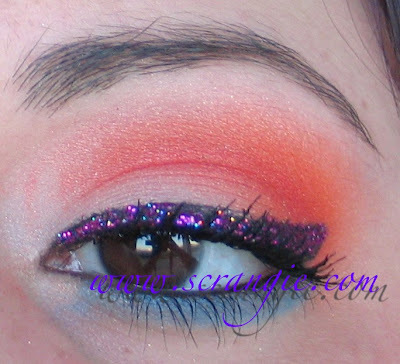 This one was pretty similar, I used MAC Acid Orange and Electric Coral, Urban Decay Peace and Too Faced liner in Super Freak over MAC Blacktrack. 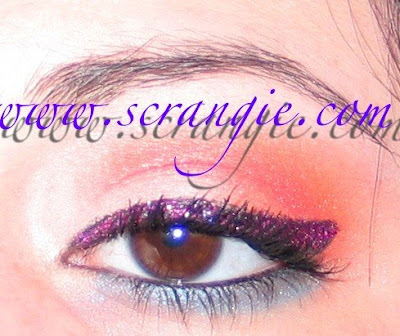 Hot pink holographic glitter eyeliner. It doesn't get much better than that. Your eyes are totally mesmerizing. I would love to have as dark eyes as you. You look beautiful! And the glitterliners look awsome! However, I love makeup- and love to see pics of it. 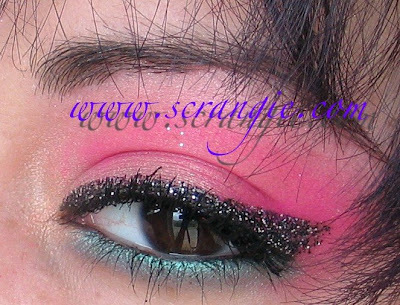 And I agree- cant get much cooler than glitter eyeliner. WOW. And your applications skills are fab. gorgeous! 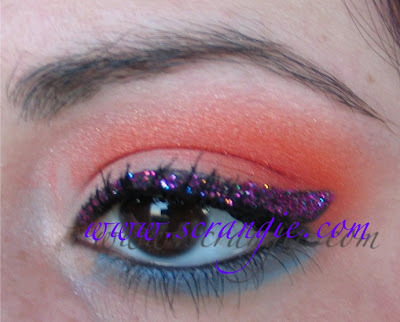 I love the color combination and the glitter! Seriously hot! Gorgeous! The eyeliner looks awesome, and as usual your application skills are fab! Honestly, I don't care much about MU, but your eyes are gorgeous. OH MY GOD I almost SCREAMED OUT LOUD in my cubicle just now when I saw that glitter purple one!!!!!!! I NEED. I saw them at Sephora awhile ago and considered buying them but thought, nah. Now I have changed my mind thanks Scrangie! :O I so envy your makeup skills. Too Faced has the best glitter lip gloss too. It's pretty smooth, not sticky, stays on a long time, and is suuuper sparkly. I think I need glitter eyeliner now though. Stubby, isn't it fab? It's so sparkly in real life! Melli, thank you! :D Happy Halloween to you as well! The Too Faced Glitter Gloss I use is called Sparkler Glamour Gloss. The only thing is that because I'm dark-skinned it does give my lips a bit of frostiness, but I still love it. I'm still hooked on my MAC Glitter Glass too. Very very nice!!! You're very good to makeup . I like a lot this site a link it on mine!! !